The newspaper claims that the list of more than 4,000 clients includes drug dealers, gun runners, bankers accused of fraud and cyber criminals. HMRC confirmed Friday that it has received and is studying the data. The tax authority did not comment on specific HSBC clients, but pledged to "crack down" on tax cheats if it finds evidence of wrongdoing. "Clamping down on those who try to cheat the system through evading taxes and over claiming benefits is a top priority for us and we value the information we receive from the public and business community," said an HMRC spokesman in a statement. Jersey, a 5-by-9-mile island just off the coast of France belonging to the British Crown, is one of the richest tax havens in the world. 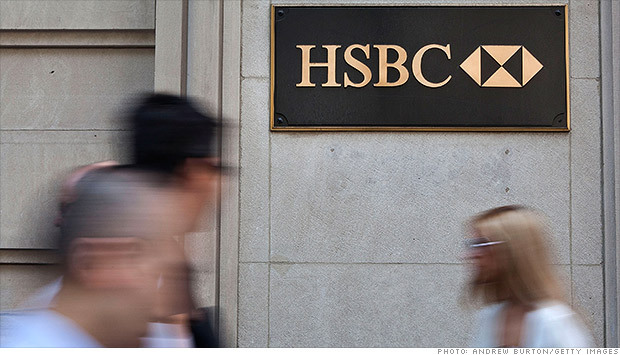 HSBC (HBC) said it was urgently looking into the matter. The bank added that it had not been notified of any investigation by HMRC, but said it would fully cooperate with authorities if it was notified. "HSBC remains fully committed to adoption of the highest global standards including the procedures for the acceptance of clients," the bank said in a statement. This is not the first time HSBC has been accused of providing financial services for criminals. In July, U.S. lawmakers issued a report claiming that HSBC failed to prevent billions of dollars worth of money transfers that were allegedly linked to drug cartels and terrorist groups.